Most women should eat about 1 1/2 cups of fruit a day, according to the U.S. Department of Agriculture. Getting enough fruit in your diet is associated with several health benefits, including protection against heart disease and diabetes. Raisins, prunes, dried apricots and other dried fruits are a convenient way to work more fruit into your diet. Although the drying process decreases a fruit's levels of vitamin C and B vitamins, dried fruit is generally a more concentrated source of nutrients than the fresh variety. Raisins are a good source of iron, potassium and calcium, while dried apricots contain significant amounts of vitamin A, magnesium, iron, calcium, phosphorus and potassium. Dried plums, or prunes, are rich in potassium and copper. Dried fruit is an excellent source of simple sugars, or readily available energy. Of the 23 grams of carbohydrates supplied by a serving of dried cranberries, 22 grams are simple sugars and 1 gram is dietary fiber. Raisins, dried apricots and prunes are even better sources of fiber. A diet rich in fruits and vegetables is thought to protect against heart disease, stroke, high blood pressure and certain types of cancer. 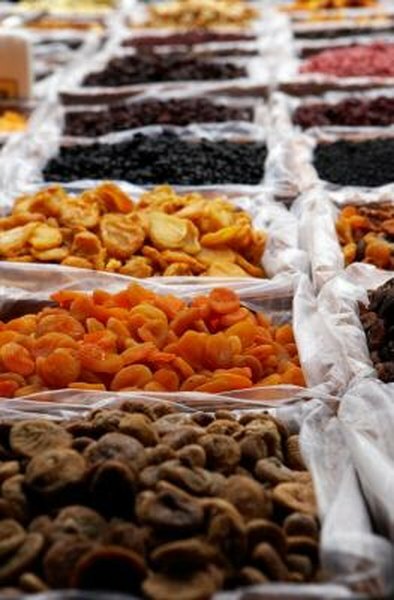 With the specific vitamins, minerals, nutrients and antioxidants present in different dried fruits, each type of dried fruit has the potential for different health benefits. Raisins have been linked to improved bone density and healthy gums, while dried apricots are associated with a lowered risk of esophagus and lung cancers, according to the American Cancer Society. Additional health benefits include preventing constipation and urinary tract infections. Dried fruits are high in nutrients and fiber while providing numerous health benefits, but certain dried fruits may contain additional ingredients that may offset these benefits. Avoid products that contain added sugar, as dried fruits are naturally one of the most concentrated sources of sugar available. HealthMad: Dried Fruits - Healthy or a Waste of Money?